USB micro-B connector - Provides power to the board and provides an interface for serial input/output using the FT230X Serial-to-USB converter. Analog-to-Digital Converter expansion header – provides an expansion header for variable-resistance circuit elements, such as a thermistor. 32.768 kHz crystal oscillator – provides an external high-precision clock source on the CEC1702’s XTAL1/2 oscillator input pins. SST26VF032B Serial Flash – Stores the program image for the CEC1702 and provides additional persistent storage for application information. Color LED – Full color PWM-driven LED. Status Indication LED – Output LED for the CEC1702’s Blinking/Breathing LED hardware module. LED Output Header – Expansion header for the second CEC1702 Blinking/Breathing LED hardware module. 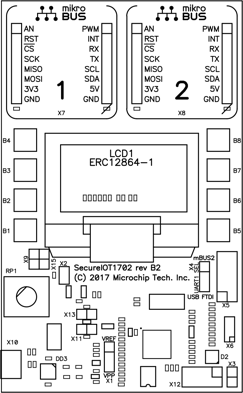 128x64 pixel LCD – EastRising ERC12864 SPI-interface LCD. Useful for displaying user application text/images. 8x general-purpose pushbuttons – provides user input. Readable by the CEC1702’s hardware keyscan module or by general-purpose I/O input. 2x mikroBUS™ Interfaces – useful for attaching a wide array of hardware expansion boards to extend the functionality of the platform.